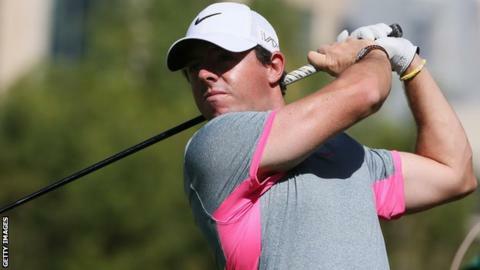 Rory McIlroy will take a four-shot lead into the final round of the Dubai Desert Classic after shooting a six-under-par 66 to move to 20 under. One stroke ahead overnight, the Northern Irishman, 25, went five clear as he reached the turn in 30, before missing a short putt at the 10th. He managed a par at the last after finding water to end the day four shots clear of Denmark's Morten Orum Madsen. England's Lee Westwood is six behind McIlroy on 14 under after carding a 69. Defending champion Stephen Gallacher is in a group on 13 under which also includes Englishmen Danny Willett and Andy Sullivan, while Northern Ireland's Graeme McDowell lost ground as his 72 kept him on 12 under. Scotland's Marc Warren, one stroke behind McIlroy at the halfway stage, dropped back to 12 under with a 73. After his rounds of 66 and 64, 2009 champion McIlroy sank five birdies in a blemish-free front nine, only to miss a 15-inch birdie putt at the long 10th. "When I missed that short putt on 10, it just seemed like all the momentum I had went away and I had to scramble a little bit for pars coming in," said McIlroy. "It was nice to make a birdie on 17 and then make a great save at the last. I'm in a great position going into tomorrow." Madsen, 26, moved into second spot as he followed his 63 on Friday with a 66 on Saturday. Westwood, 41, managed two birdies in his opening three holes but missed several chances before carding a double bogey at the difficult ninth. Two closing birdies allowed the former world number one to move into third place on 14 under.